Like many hearts build a home, every home needs a shed. The quintessential Aussie shed. It’s home to all the things the missus won’t let you have in the house. Of course, you probably wouldn’t need one if she wasn’t around, because your dirt bike would be parked in the lounge room, your boat in the garage and your tools in the spare room. Only in a perfect world Jimbo. Only in a perfect world. So we need our sheds. We need our man caves, our home away from home, although it feels more like home than your actual home sometimes. We need a place to store our toys and tools and place to think and drink with boys to discuss future projects that may never come to fruition. A place to unwind after a big day and be surrounded by the things you love the most. Your boat, your bike, your tools. The things that serve you the most and never ask for anything in return. But, as the laws of nature dictate, all force and no resistance equal an imbalance in the system, so it’s best to give a bit back. You wash your bike after a big day’s ride, lube it and then park it in the shed so it’s ready for the next ride. 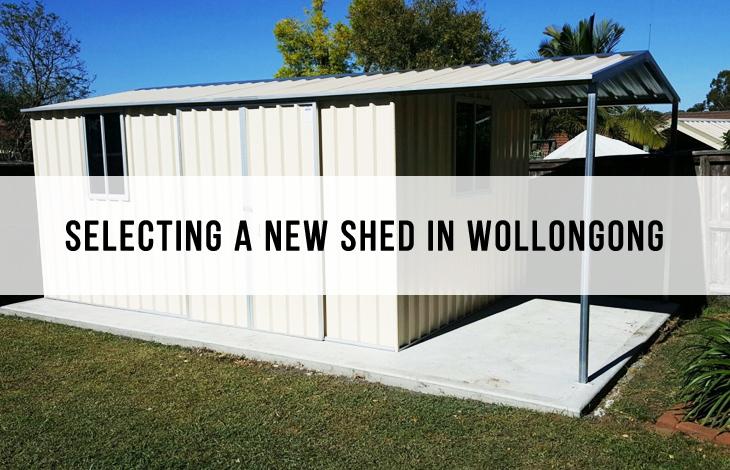 So, when buying a shed in Wollongong, foresight is of utmost importance. I’ve been there, I’ve done that, so I’ve come up with a checklist to give you blokes a little bit of a heads up. Size does matter, only small people say it doesn’t. Obviously, we are still talking about sheds. The bigger the better I say. I like some space to work with and section the shed off into different areas such as vehicle storage, tool and work zone, and entertainment area. But you may be more practical than me and require less space. It all depends on what you’re going to use it for, and the dimensions you have to work with. Also, think about the future. I’ve lost count the number of times I’ve said that “This is the last one”, after purchasing a new bike, boat, or toy. Deep down I knew it was bull. And sure enough, a 1995 model CR500 later and telling myself it was the last one, I need more room in my shed. Well, it all depends if you’re getting a small run of the mill garden shed or a man cave. A concrete slab is preferable by all means, but if you’re just storing your mower and some other useful small things in there no slab is fine. It all depends on budget and requirements. Having a shed with a concrete slab solidifies the structural integrity of the shed and provides a more conducive working environment especially when getting under cars to do some work. I usually put a few old rugs down in the car bay and the entertainment area. It gives it a homelier feel and acts as insulation. The flat roof shed is the budget option. It’s ideal for small garden sheds that are merely used for storage or if you have certain space requirements. If you take your shed as seriously as I do, a gable roof is the go. They are slanted so that if you want to add some guttering and collect some rainwater then it runs down into the gutters. The gable roof also provides more airflow and gives you more headroom. The colour may seem trivial, but your shed is an extension of your home and your home is an extension of your personality and your personality is all about how many cool toys you own and where they’re housed. So, choose a colour that expresses your personality. Also, certain colours attract heat more than others. Darker colours will conduct heat whereas a lighter colour will reflect the heat. This may not matter too much, it all depends on your location. I live in Bundaberg, so I went for the lighter colour and it seems to keep cool enough. I tell you what though, it’s a sight cooler than my mate’s green shed. That’s the checklist. These are the considerations to make when buying a new shed to house your beloved boats, bikes, toys, and fun times to be had with the boys in the man cave. Alternatively, buy a boring little garden shed to house your mower and live a life of boredom and grass clippings. I’m just kidding. It’s all about practicality and buying one that suits your budget and needs. Buying a shed isn’t brain surgery, but a little common sense and foresight goes a long way to make the process a little smoother and ensures you have that extra room for the bike, boat or toy.